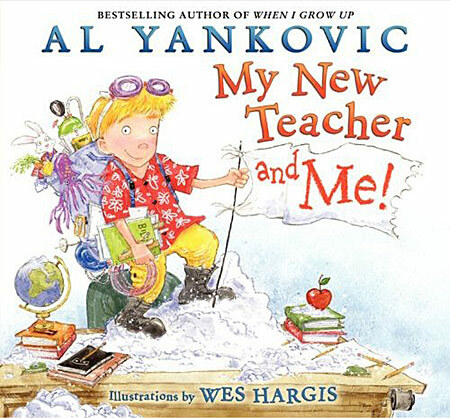 Weird Al” Yankovic recently authored My New Teacher and Me!, his second children’s book. It features “Billy, a small boy with a big imagination” who meets Mr. Booth, “his new teacher – a serious man with a strict lesson plan.” Both books are wonderfully illustrated by Wes Hargis. Yankovic is currently touring on his Alpocalypse Tour (including a stop at the Alameda County Fair in Pleasanton, California on July 5th which I’ll be attending!). Weird Al” Yankovic’s new tale of Billy, the irrepressible star of the New York Times bestselling When I Grow Up, is an uproarious back-to-school delight. Dazzling wordplay and sparkling rhyme combine in a unique appreciation of the rewards of unabashed originality and the special joy of viewing the world gently askew.